A ship moves up and down in water depending upon the amount of cargo it loads. While there is strict rules governing limits to which a ship can load; there is only a handful of guidelines for maximum permissible buoyancy. A buoyancy is the upward force that a submerged object experience; equal to the weight of water it displaced. For long we have known it to be the force that stabilize floating object helping it afloat; but what if its go out of hand ? A ship with too high buoyant force struggles with propulsion; with an increased risk to topple to its sides in bad weather. So, to retain ships stability; additional weight is taken on board ship to compensate for the increased buoyancy due to cargo discharge. Historically hard weights in form of rocks and sand bags were used to stabilize ships; which gradually shift to using available sea water for the purpose. A ship takes sea water into its tanks for the purpose of maintaining stability with the water taken being called ballast water; while the specific tanks used for the process is called ballast tanks. The complete process of taking in sea water to dedicated ballast water tanks while cargo discharge is known as ballasting. High capacity centrifugal pump in form of ballast pumps are used for the process; water is discharged to the tanks after taking suction from the sea chest via a suction strainer. The amount and rate of ballast to be taken depends on the weight of the cargo and the experted time required for the cargo operation. When the ship load cargo and no longer need to hold ballast water; it discharge its ballast and the process is called DE-ballasting. To better understand the positive effects of ballasting; let us consider a simple ship with six cargo holds. Now to make things easier for you to understand neglect the effect of stress and weight; due to ships superstructure, engine room machinery and other parts except the cargo holds. If you look at the given diagram; you can see all the six cargo holds of the given ship is filled with cargo. In this situation the net buoyant force exerted on the ship is balanced equally by the weight of the cargo in six cargo holds. Consider a case where the ship discharge cargo from two of its tank / hold at port A. Now since the ship does not add ballast water onto it; two of its cargo holds remain empty. In this condition the buoyant force acting on the ship is equally distributed like before; but the force due to weight distributes on the both side of the empty cargo holds. This kind of uneven distribution of weight create bending and shear force in hull structure leading the ship to bend. In this case it create a bulging shape towards the upward with the process of deflection known as hogging. Similarly if the ship discharge the cargo from all other tanks other than two; it leads to a condition called as sagging. This can be categorized by the bulging of the ship structure downwards under the force of weight and shear stress. Now if we slowly add water to these tanks by the process of ballasting; all the forces acting on the ship equalize providing the stability to the ship structure. You can clearly see how buoyant force is equalized by the weight of sea water that fill the tank. The world is not quite idle and quite as it is under the controlled environment. At sea a ship is subjected to varying forces such as buoyancy and weight distribution of liquid cargo. Even more there is effect of weight of the superstructure and the engine room machineries on ships hull. Even more the ballast water or liquid cargo is subjected to rolling and pitching; generating varying weight distribution that effects the stability of ship. From the above diagram one can see the effects of varying longitudinal wave forms on the ship structure. Here, the buoyant force at point b is less than the buoyant force at point a and c. Together with varying buoyant force and irregular weight distribution due to empty cargo holds and waves; It lead the ships to capsize or minimum undergo substantial damage. So ballast water is filled in these dedicated ballast tanks and then pumped from one tank to another to meet stability when required. It is a common practice to use top side tanks, hopper, fore peak, aft peak and double bottom tanks in bulk carrier as ballast tanks. Similarly side tanks, double bottom tanks, aft peak and forward peak tanks as ballast tanks in cargo and tanker ships; with just double bottom, aft peak and fore peak tank as dedicated ballast water tank for Ro-Ro vessel. These tanks are even segregated into separate artificial sections within; to reduce the free flow or so called free surface effect of ballast water. Not all ships store or discharge the same amount of ballast water at any point of time. 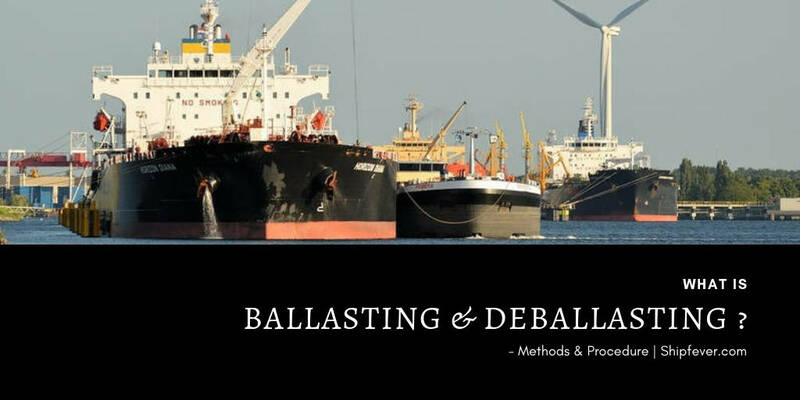 While it is common logic to think ships discharge all of its ballast when its load cargo; in reality its not so simple and depends on a number of factors. A ship can be restricted to discharge ballast in certain areas or might need to take in fresh ballast to meet regulation; the list goes on and on. So the amount of discharge really depends on the situation at that particular time frame. A ship depending upon its type carry a different variety of goods across sea. If it loads a cargo that is light say “paper rolls” the ship would not discharge as much ballast in port; which it would otherwise discharge for heavy cargo such as ore. Similarly a tanker carrying dense oil cargo needs to discharge more ballast; during cargo operation in comparison with a tanker carrying light cargo such as wine or juice. There is also a variation in pattern of ballasting; depending upon person in charge of ballasting operation. This is extremely true in case of simultaneous discharge and loading of cargo at the same time; operating person has to take decision based on situation whether or not to discharge or take ballast at the time. Similarly during bad weather it is a common understanding among ships personnel; to take in all possible ballast to safeguard safe of ship and safe navigation. So yes ballast water discharge depends on the type of ship, cargo operation, cargo type, weather, local rules and operating personnel decision. While shipping accounts for more than 80% of global trade; a large portion of ship moves from one part of the world to another. With these moving ships a large portion of ballast water moves from port A to port B; negatively affecting the ecological balance of the region. While most marine life cannot live up to complete their journey; few survives that then have vast reason to concur without their natural predators. In lack of their natural predator they grow exponentially disturbing the ecological balance of the region. First such event of ecological imbalance due to ballast water discharge was reported in 1988 Canada. Such incidents gradually increase over time spreading across the word to create panic amongst environmentalist. Looking the seriousness of the issue; IMO came up with a convention on ballast water management in 2004. New regulations were made to control and manage the ballast water and its sediments on board ship. The convection came into effect on September 8, 2017 covering all marine vessels except used for military. To comply with the regulations each ship have to came up with a separate ballast water management plan; with a dedicated ballast water management record book. The time and amount of each ballasting operation should be recorded in the record book; even for the ballast released to shore facilities. Furthermore the ship has to undergo regular checks on behalf of flag state to receive and maintain certificate that states; the ship complies with the ballast water management convention ( BWM ) 2004. Under Article 2 of the BWM Convention its is stated that; the more stricter laws for ballast water will be in effect fore more than one regulating party involved. Each ship have to made an unique ballast water management plan specific for that ship. The ballast water management system on board should not be such that it negatively affects the operating crew, ship or its resources. Sediments of the ballast tanks should be hand over to the on port reception facilities. Article 7 and 9 of the BWM convention 2004 allows for the inspection and survey of ships by port authorities ( port state officers ) and flag state. A ship is required to present; valid certificates, updated ballast water record book along with ballast water sample if asked. Under regulation B-2 and B-3 of BWM convention; all ships are required to record the exact time and amount of ballast water discharged overboard or transferred to shore facilities. The record book should be maintained regularly with provisions for entry of any accidental discharge. For ships using pump through exchange method for ballast water management; it is required to pump out at least three times the normal capacity of the tank to meet the 95% efficiency of volumetric exchange. All discharge should be done at least 200 nautical miles from the nearest land and with sea depth of minimum 200 meters. If not possible it must be not less than 50 nautical miles from nearest land with 200 meters depth. Why to waste resource and power when you have mother nature on your sides. Many a times different ballast tanks have different levels of ballast water isolated by a valve. Similarly there are times when the water level in ballast tank; is either lower or too high than sea water level outside. This came in handy saving a great deal of resource and electric power to do the job. All we need to do is to allow water to flow from higher level to lower under the effect of gravity. The process works for all tank size regardless of their length, position and area; just under the effect of simple natural law such as gravity. On ship the process is sometimes refereed to communicating with tanks or the process of vessel communication. The process is used generally for equalizing ballast among tanks, take light ballast or to assist the process of ballasting for the initial period. Remember shipping is a commercial activity and everything that saves power, and money is a worth. The process of deblasting is also simple and easy as of ballasting where the water at higher level in tanks are released to sea via their natural flow. The booster pumps only taken in when the water level equalize in between them. While using gravity during ballasting operation; care must be taken to avoid flow limit to exceed the working limit of the used pipes. It is common to see high flow rate during start with a gradual decrease in speed as the level equalize. Dedicated ballast pumps installed in pump room on a ship is used at times you can pump in or out water using the gravity. These pumps are capable to take suction from sea or any of the ballast tank to discharge overboard or to any desired ballast tank on the ship. They are generally vertically mounted high capacity ( high flow & Low NPSH ) centrifugal pumps with additional priming motor. They are usually controlled automatic to assist duty officer and avoid damage to the system due to human error. If the pumps to be run manually it is a must to ensure the suction is primed properly, the discharge valve is shut and the ampere rating are normal on the pump start. Discharge valve is slowly opened once the pump stabilize and care must be taken not to over pressurize the given tank. Much of these hassle can be reduced simply by putting valves and ballast pup on auto. At no times the pump shall be run dry or overloaded. 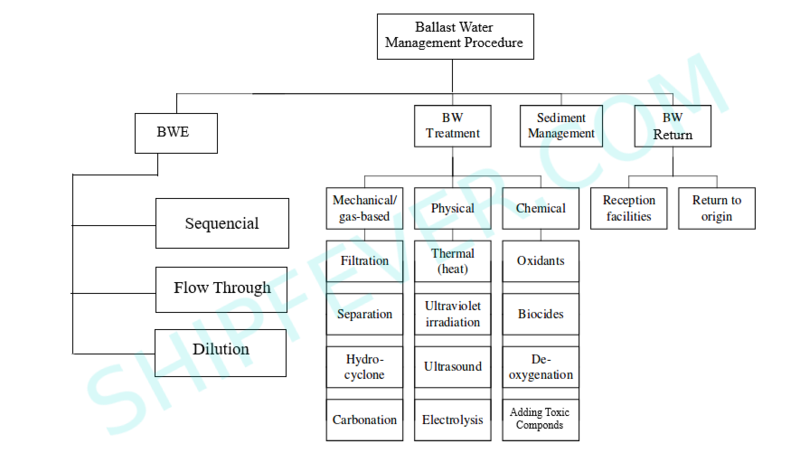 The ballast water management can be classified into four key procedures; ballast water exchange, ballast water treatment, sediment management and ballast water return. Any two of the above procedure can be chosen to comply with the regulation. It is a common practice to use sediments management along with any of the three methods to avoid passing of organisms from one part of the planet to another. The simplest method to comply with BWM 2004 convention is to use either of three exchange method accepted by IMO; sequential exchange, dilution and flow through exchange method. Under sequential exchange method; the ballast water taken in port is discharged and exchanged with fresh sea water. The process should be conducted as such it archive at least 95% volumetric efficiency. The process should be completed taking under consideration of; ships stability, longitudinal strength, sloshing, free surface effect, propeller immersion and hull vibration due to sea waves. If done wrong it negatively affects the ships stability and structural stress with reduced forward draft. Flow through exchange method is used when the sequential method doesn’t seems possible due to stability issues. In flow through method; excess sea water is used to overflow the tank at least three times its natural volume. The method does not affects ships stability and considered safe and easy to operate. Dilution method on other hand use similar but different method where; the water is filled continuesly from top and removed or discharged at the same rate at all times. It helps reduce the overall sediments and much needed work to maintain stability. Similar to the flow through process it too require to change the water at least three fold of its original volume. To ensure their ships complies to all local and IMO regulations; special plants are installed on board to treat ballast water. The system should be such that; it not only kills marine organism in ballast water but are also environmentally safe. They should also be easy to operate; cost effective and does not negative effects the operating crew. So the approved method that can be used are mechanical, chemical or physical treatment. A mechanical treatment plant is the one that use simple mechanical process such as; filtration, separation, carbonation and hydro cycle to remove aquatic life from ballast water. They are easy to construct and maintain low operating cost. While the physical separation includes process such as; thermal heating, ultraviolet radiation, electrolysis and ultrasound techniques. On other hand chemical separation includes methods such as; introducing oxidants, toxic compounds, biocides and DE-oxygenation. All ships made after 2006 are required to be designed to reduce the sediments trapped on tanks sides or its surface. Ample steps must be taken to meet the desired criteria for ships prior to the date. Under section “B-5” of the BWM convention; ample consideration must be given in design to facilitate safe removal of sediments from the ballast tanks. A way must also be given to take regular samples with ease on board ship. At first ample steps must be taken to avoid sediments accumulation. The most common method to do so is by flushing the ballast tanks with sea water. Just before the final ejection of ballast water from the tanks; it is flushed with fresh sea water to dissolve sediments. Tanks should always be flushed outside port waters i.e 200 miles away from nearest land with a sea depth of 200 meters. What remained must be monitored regularly and to be discharged to the desired authorities on port or at dry dock. Ships with no process to either treat or exchange ballast water tends to store it and discharge only to the designated port authorities. By law it is required by the port authorities to provide such facilities on request or make alternate arrangement. Ships that work in regional waters along a very narrow path; can easily take in and out ballast meeting the IMO requirement of discharging in the water of origin. So small regional offshore vessels enjoys loading and unloading of ballast in local waters; large ships are provided with facility on request to transfer ballast the the port authorities.